What is it? It’s a 3 Day plan from Beachbody that “Instead of leaving you depleted from fasting, after 3 days you feel energized, lighter, REFRESHED!” I’ve done it twice before. The first time was tough, the second time I cheated on the plan. Had a glass of water when I woke up (a rare thing). The morning was the Chocolate Vegan Shakeology blended with water, ice, and half a banana. Drank that while prepping the next three days. Fiber Sweep – gritty texture, but I like the taste. Lunch: Drank the Vanilla Fresh before heading to the Padres game. Had hummus and carrots and blueberries for lunch. For the snack, hummus and carrots. V had chicken tenders and gourmet french fries. It looked good, but it smelled better. Not fair (but it was my choice). 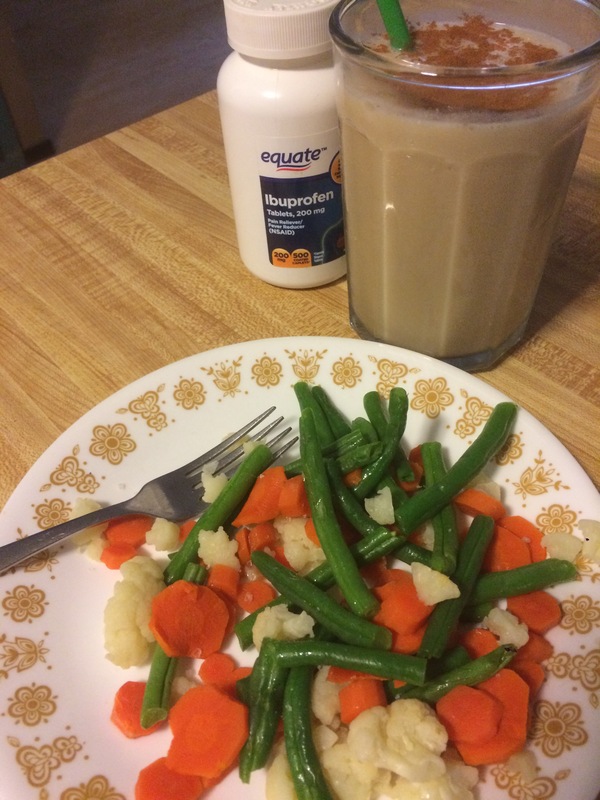 Dinner: Steamed veggies with coconut oil and salt. This was really, really good. Fell asleep at 8:00 pm at the start of a headache (went coffee-free this time, so it withdrawal symptoms). Exercise: Not a planned program, but I walked 7,000 steps. Day 2 food for the day, minus the Shakeology and 1/2 banana. Woke up with a headache. Started the day with two ibuprofen and a glass of water. Repeat breakfast. To help temper the headache, I had a cup of green tea. Slightly helped. Drank the Fiber Sweep later than expected, so lunch was delayed a by an hour. 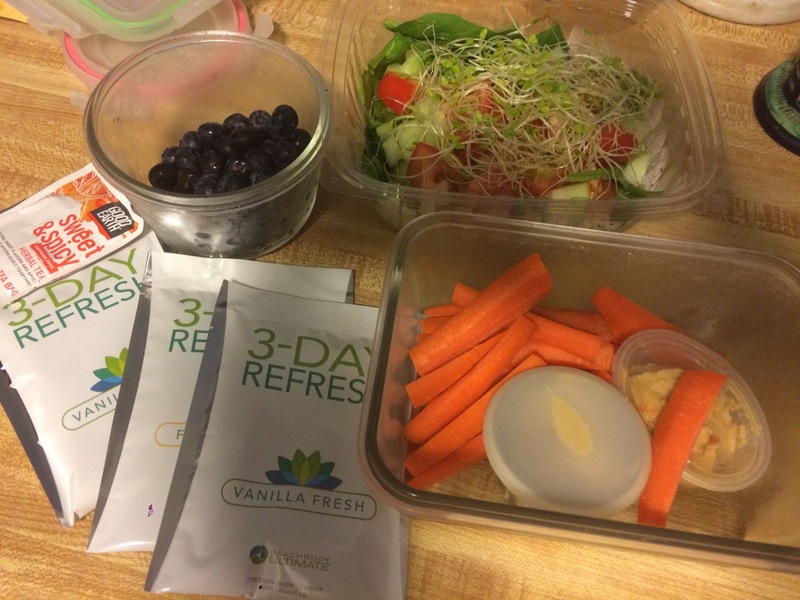 Lunch: Vanilla fresh with water, blueberries, hummus and carrots. No baseball food to tempt me this time! Snack: Carrots and hummus. Yes, I know I could have more variety, but I didn’t want to spend a lot of money just to have one serving of something different. Suddenly my salad didn’t taste as good. Managed to survive the game, but that night…I cheated. I ate some trail mix. Had a massive headache. So bad, I called in sick. Between sleeping, ibuprofen, and drinking water, the day mirrored the first day. However, instead of going to bed early, I ate: peanut butter, cheese, and graham crackers. Even though I didn’t follow the plan exactly, I lost weight. Of course I lost weight. I ate way less than I normally do (if you use Weight Watchers language, it’s 20 points worth of food). I lost 5 pounds, but no inches. Would I do this again? Probably. It is a kickstart, and the first thing** I ate this morning is fruit, not cereal. It showed me I have a major caffeine addiction. I also had a difficulty with wanting to eat when I had no more food in the plan. I was hungry! *I am not a Beachbody coach, just a customer. **The second and third things I ate were a sourdough jack and curly fries. Have I learned nothing?